Garry and Rio here! It has been a long time since you have heard from us, we know. So now it is with great pleasure that we write you about a couple exciting events that we are involved with in our service to Haiti! We would love for you to come out and support either or both of the events, and give to whichever cause touches your heart! Mési anpil! First, one of our mentor organizations, Community2Community (C2C), will be hosting its 5th Annual “Hope and a Future” (HAAF) – A Celebration of Haïti. HAAF is C2C’s yearly signature celebration to raise awareness and funds that will go towards completing their Haiti Restoration and Transformation Pilot Project (HRTPP), and to create a community of C2C Neighbors (monthly investors) who believe in their mission and vision to “create self-sufficient communities by working with the community”. The celebration will premiere “Piti Piti” (Haitian Kreyòl for Little by Little), a multi-media theatrical production depicting the urgent need to complete the C2C HRTPP. Rio Tasia Guillaume is thrilled to be a part of the production as a choreographer and dancer among other talented artists such as International Haitian Musician, BélO! 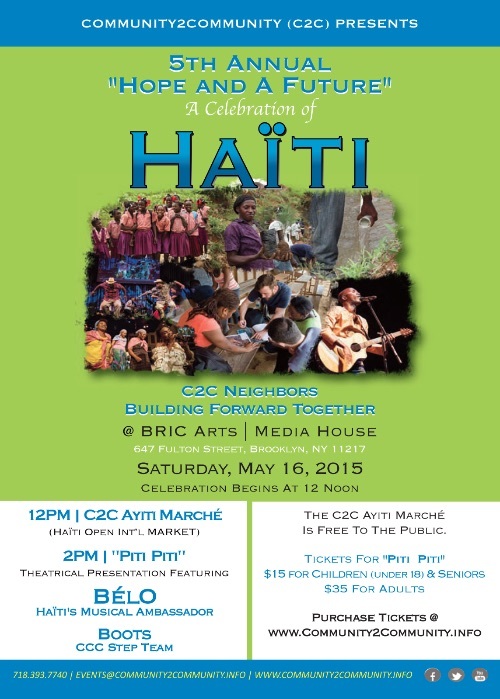 In addition to the “Piti Piti” production, the lobby of the BRIC Arts Media House will transform into C2C’s Ayiti Marché (Haitian Kreyòl for Open Market), hosted by Celebrity Haitian Culinary Artist Nadege Fleurimond. The C2C Ayiti Marché will expose guests to the country’s rich artistic and cultural contributions through various artisans and exhibitors, such as Garry Guillaume! Music, raffles, giveaways, and promotions will occur throughout the Marché. The C2C Ayiti Marché is free and open to the public. Tickets for “Piti Piti” are $15 for students and seniors, and $35 for adults. To purchase, visit http://www.community2community.info or call 718-393-7740. Community2Community is a 501(c)(3) non-profit service organization. This entry was posted in Uncategorized by Voice of Jean Rabel. Bookmark the permalink.